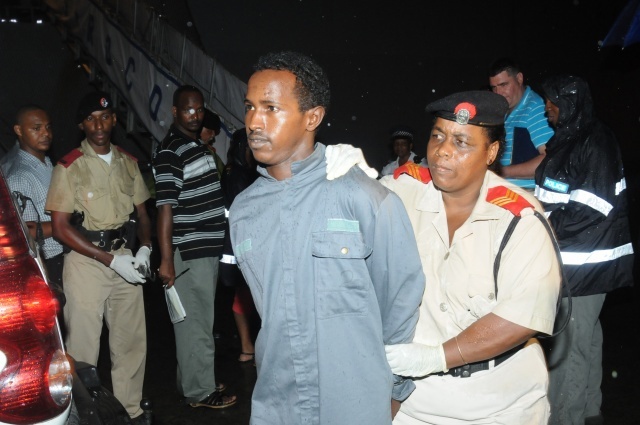 (Seychelles News Agency) - The trial of a final group of suspected Somali pirates being remanded in Seychelles will be heard until the end, the island nation’s Supreme Court has decided. The lawyer was arguing that there’s no evidence that they were guilty of the piracy charges against them. The Somali men are facing three counts of piracy, believed to have been committed between January 1 and January 18, 2014. They stand accused of attacking a dhow and holding the Indian crew as hostages. The pirates are accused of then using the dhow as a pirate ship to attack an oil tanker. The five suspected pirates were transferred to Seychelles on January 30, 2014 by French naval ship FS Siroco. “I am satisfied that the prosecution has established a prima facie case [the establishment of a legally required rebuttable presumption] that all five accused persons were participants in committing the offences charged,” said Judge Dodin. The case was heard at several intervals during 2015 and the Judge explained to SNA that it has taken so long because the witnesses in the case are foreigners and they had to come to Seychelles to give evidence. “With the new video evidence system installed in the court, once everything is settled it will help with this situation of having witnesses give their statements wherever they may be,” Judge Dodin told SNA. The case is expected to resume later this month when the five Somalis are called upon to make their defence and according to Judge Dodin it should be settled in two to three months’ time. Seychelles, a 115-island archipelago in the western Indian Ocean, ended up placing itself at the forefront of the fight against piracy as the scourge, which began to plague the Indian Ocean in 2005, had a direct impact on the country's tourism and fisheries sectors. Over the last six years the island nation has conducted 17 piracy trials, convicted 138 pirates and tried 142, which is more than any other country in the region. There are currently 22 Somalis incarcerated at the Seychelles main detention facility, the Montagne Posée prison. This includes the last group of five that are being prosecuted. Seventeen convicts are awaiting transfer to continue serving their sentences in their homeland.